If the light does not operate, we recommend that the system be checked by an authorized Kia dealer. Do not attempt to replace or inspect the low beam (XENON bulb) due to electric shock danger. 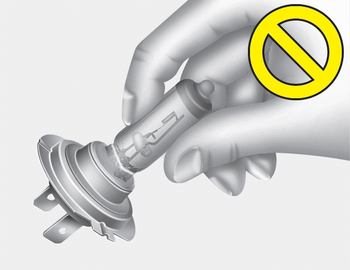 If the low beam (XENON bulb) is not working, we recommend that the system be checked by an authorized Kia dealer. The low beam light distribution is asymmetric. If you go abroad to a country with opposite traffic direction, this asymmetric part will dazzle oncoming car driver. To prevent dazzle, ECE regulation demand several technical solutions (ex. automatic change system, adhesive sheet, down aiming). This headlamps are designed not to dazzle opposite drivers. So, you need not change your headlamps in a country with opposite traffic direction. If a bulb is damaged or cracked, replace it immediately and carefully dispose of it.